Students will learn the particulars of cutting, grinding and the particulars of preparing a project for film firing. The course will also cover glass safety and the use of tools and equipment relevant to kiln formed pendant making. Each student will make four pendants including a geometric pendant, diachronic splash pendant and a fused pendant with a glass loop. In the interest of safety all students will need to bring along safety glasses, gloves (rubber dipped recommended) and wear closed toe footwear. 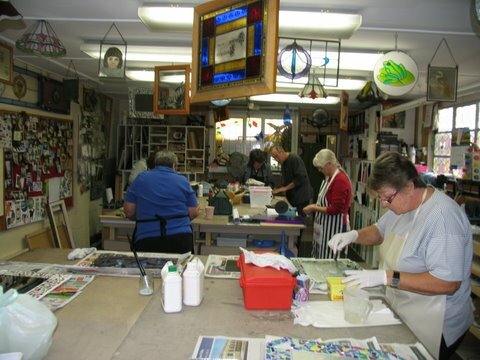 Ageless Leadlight’s conducts classes in lead lighting, copper foil and glass mosaics. Caution: Some medical conditions may exclude you from attending Leadlight Classes, please consult your doctor if you are pregnant or plan to become pregnant before enrolling. NATIONAL SERVICEMEN'S ASSOCIATION OF AUSTRALIA.